In the world of backline there is nothing worse than saying "I'm sorry we don't have that piece available". When you're supplying equipment for legendary artists and major festivals you have to have a big league inventory to back it up. Eventcraft over the years has added a number of vintage instruments to our inventory in order to be able to say "Yes!" to artists and our loyal customers. 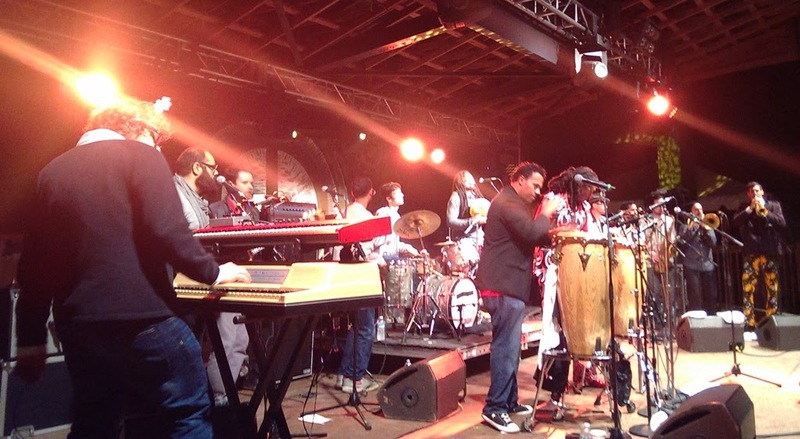 Every year we have the privilege of working with some of the music world's greatest living legends and this year included legends such as Kris Kristofferson, Willie Nelson, Steel Pulse, America, Eddie Palmieri, Poncho Sanchez, Alabama, John Fogerty, Mavis Staples, and Bernie Worrell, just to name a few. Some of you may be wondering what is a vintage instrument? We consider a vintage instrument a piece of musical equipment that was manufactured before 1980. Some may argue saying vintage would describe pieces 10 years older than that but we'll leave that debate to the nerds. At Eventcraft we regularly fulfill requests for vintage instruments. These instruments make up a significant part of the sound of classic albums and songs you know and love. Some of the most popular vintage instruments we have in our inventory include: Hammond B3 Organs, Fender Rhodes Electric Pianos, Wurlitzer Electric Pianos, Hohner Clavinets, Vintage Slingerland and Ludwig Drums, and Vintage Analog Synthesizers such as the Juno 106 or Oberheim Matrix 6. The list goes on. The large instrument to the left is the mighty Hammond B3 Organ and the wooden cabinet to the right of it is a Leslie 122 Speaker Cabinet. Hammond B3 tonewheel organs were manufactured between 1954 - 1975, the organ pictured here was manufactured in 1967. They have been used on tens of thousands of recordings and classic albums. 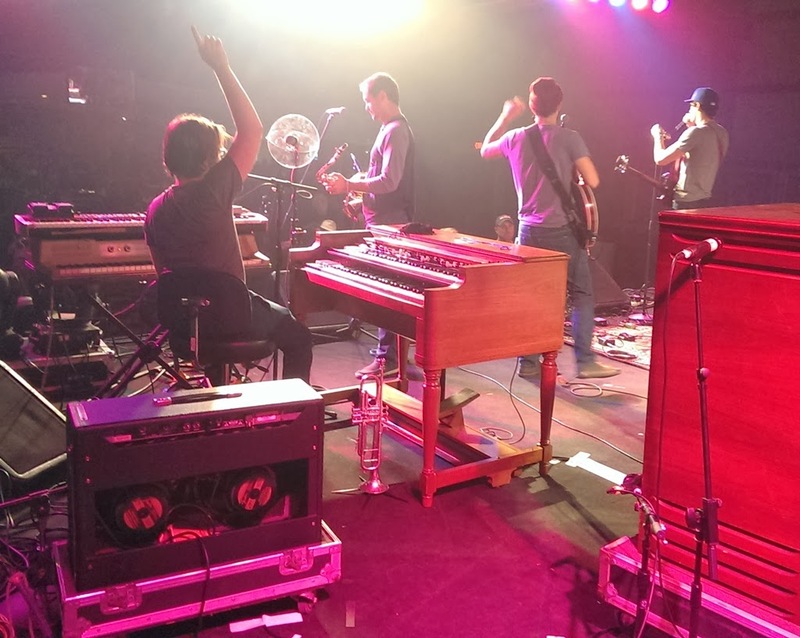 The Hammond Organ is by far the most popular organ in recorded music and it is a very popular instrument to see on stage to this day. The picture on the right shows three vintage pieces all of which are part of Eventcraft's inventory. The keyboard furthest to the right standing on its own is a Wurlitzer 200a Electric Piano. This Wurlitzer was purchased from Vintage Vibe, the leading specialist in Wurlitzer Electric Pianos in the United States. It was completely refurbished and is in absolute A+ condition both in tune and tone. 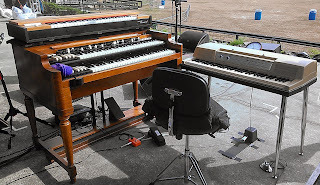 To the left of the Wurlitzer on top of the Hammond Organ sits a Hohner Clavinet D6 which is probably best know as the first instrument you hear on Stevie Wonder's song Superstition. Most backline technicians are afraid to be around a Clavinet on stage because they don't understand how to tune or calibrate the instrument. We on the other hand have made repairing and refurbishing Clavinets a personal hobby and are more than comfortable opening one up to make adjustments or tune the instrument on the fly. The day this picture was taken happened to be our technician John's birthday. 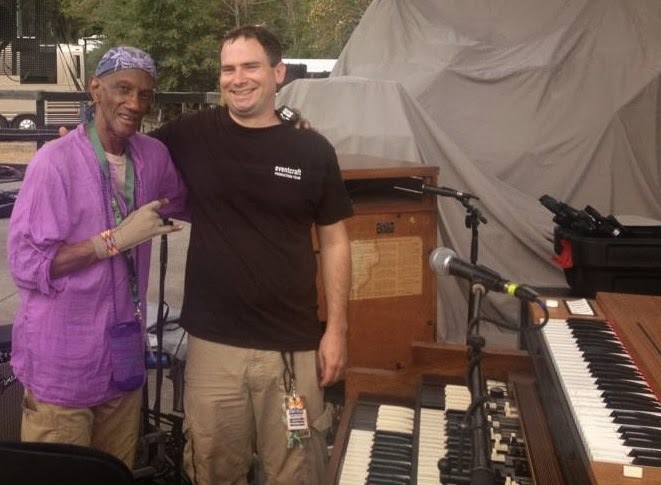 John said the best part of that day for him was meeting rock and roll hall of fame member Bernie Worrell and hearing him play. Bernie Worrell is a founding member of the funk band Parliament-Funkadelic. He has played with hundreds of different artists adding his unique touch and creative genius to their music. 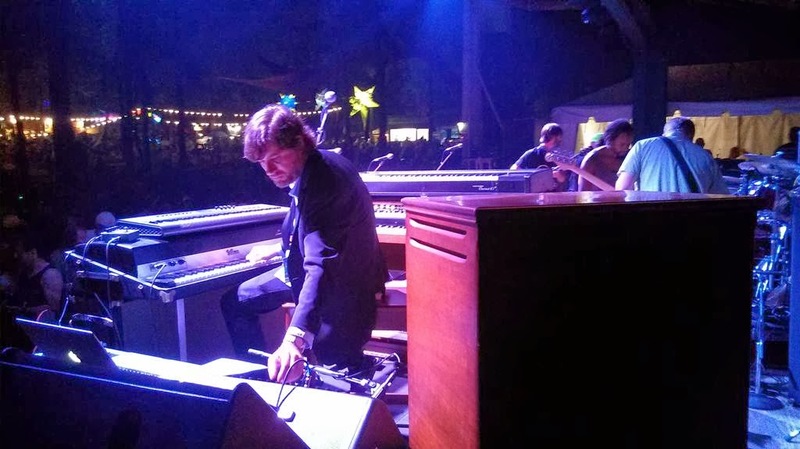 John was lucky to see Bernie play twice this year, once with Steve Kimock and once with his own group the Bernie Worrell Orchestra. Bernie is a virtuoso on the Clavinet, Wurlitzer and Hammond Organ. Search for a video of him online and you'll see and hear what we mean. Every backline company has drum sets (we hope). But not every company offers vintage drum sets. 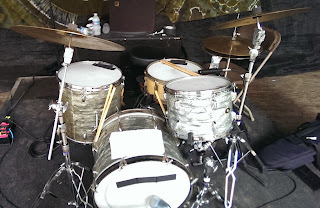 Drummers can be the most particular member of a band in regards to their instrument but especially when a backline drum set is being supplied for them. Drummers need to walk in and feel comfortable that they can get a sound they are use to and a sound that fits the type of music they play. When we work with artists on the Daptone label they expect to get vintage gear. The drum set in both the picture on the left and the picture below have been played by drummers with Daptone artists Sharon Jones and the Dap-Kings, Charles Bradley and his Extraordinaires, Antibalas, Lee Fields & The Expressions, The Sugarmen 3 and The Budos Band. The styles of music these drummers play requires that vintage sound. The characteristics of a vintage drum could be described as "dead" or "dampened", "warm" and "muffled". 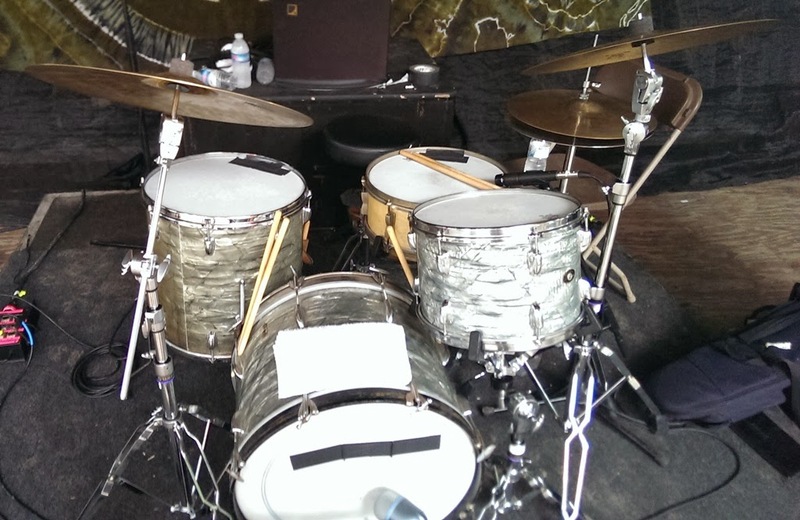 Vintage drums tend to have a wide range of these characteristics and the sound they make is one of a kind. The drummer who played the drum set in the picture added some gaffers tape to the heads of the drums to get a more exaggerated dead and dampened sound. The last vintage instrument to note is the Fender Rhodes Electric Piano. 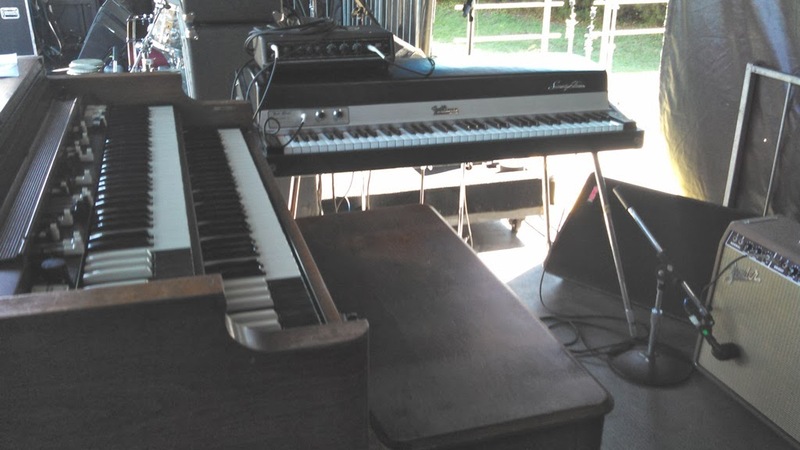 The Fender Rhodes is distinctly different than the Wurlitzer Electric Piano. The action is a little heavier, the piano is easier to adjust in tone. It can be made to sound soft almost like a bell or it can be adjusted to bark and distort slightly creating a more funky and dirty sound. Eventcraft has several different Fender Rhodes in our inventory. Fender Rhodes come in 2 main flavors, Stage or Suitcase. The Suitcase Rhodes (pictured above) sits on top of it's own speaker cabinet and amplifier made by specifically for it's own amplification. The Stage model (pictured right) is a stand alone unit that typically stands on 4 metal legs. It is a passive instrument and is typically plugged into a guitar amplifier to amplify it's sound. 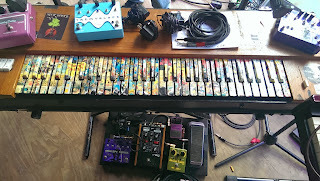 Fender Rhodes require regular tuning and adjustment. They are truly unique and very popular even today and like all of these unique vintage instruments they are used in modern live and recorded music. Owning and offering these beautiful vintage instruments requires the care and attention of a knowledgeable backline company. We are proud of our collection of vintage instruments and next time you see one on stage appreciate the one of a kind sound you are hearing. There is nothing quite like the sound of a fine piece of vintage gear.